For its part, China has expressed its own concerns  over US cyber activities, most recently suggesting that the Pentagon’s latest cyber strategy ‘will further escalate tensions and trigger an arms race in cyberspace.’ Lu Jinghua, a scholar from the Chinese Academy of Military Science, has also questioned the implementation of the strategy itself, doubting the US attribution capabilities and the legal basis for US offensive operations. Of course CCDCOE’s own attempt to apply international law to state activities in cyberspace, The Tallinn Manual Process, has faced its own criticisms over its transatlantic framing—something Jessica Woodall and I will discuss on The Strategist  tomorrow. International law isn’t the only means to govern activities in cyberspace; states continue to jostle to shape international norms in cyber. 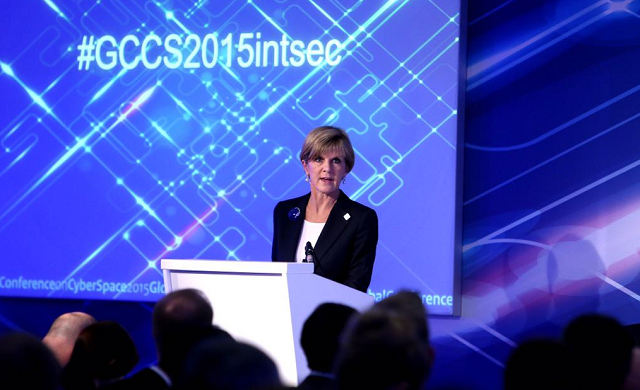 At the Global Conference on CyberSpace (GCCS), Foreign Minister Julie Bishop  called an international agreement on international security ‘premature,’ offering instead her own proposal for peacetime norms that would place critical infrastructure off limits for cyber attacks, recognise the special status of CERTs, and boost cooperation to reduce cybercrime. Joseph Nye , who moderated the GCCS panel, agreed that ‘the inability to envisage an overall cyber arms-control agreement need not prevent progress on some issues now.’ With these same norms echoed by US State Department Coordinator for Cyber Issues Chris Painter , there is reason for optimism that ‘progress on some issues’ might be possible. Of course the shaping of state relations is but one of a plethora of challenges in cyberspace. For Australian and New Zealand businesses the latest threat comes in the form of a $7500 DDoS extortion scheme . Although this may seem like a small hit for some businesses, it represents just a small part of what the Australian Crime Commission  estimates is over $1 billion per year in cybercrime damages. To overcome the threat, it’s becoming increasingly clear that public–private cooperation will be critical. A Department of Homeland Security  chief technology officer has called robust partnerships key to national cybersecurity while Japan  is pursuing its own measures to boost information sharing and increase secondments between government and the private sector. With the six-month time frame for Australia’s own cyber security review  quickly approaching, it will be worth watching how the government will improve its own cooperation with industry, a key priority in the review.